Founded in 1893, Sacred Heart Church continues to be an anchor in the neighborhood known as the “Segundo Barrio” or Second Ward. Throughout the years the parish has served the community’s spiritual needs but beyond that are the many services and opportunities for individuals seeking to improve their lives. Along with the Jesuit community and the many friends, benefactors and volunteers, the Church has been able to respond to the needs of the area. The Social Service Center provides various weekly adult classes, Catechism classes prepares the youth to receive their sacraments, Project Gabriel and St. Vincent de Paul both help those who find themselves in a moment of crisis. We are a border community with roots both in Mexico and in El Paso’s “Segundo Barrio”. Our community is mostly made up of immigrants who have a host of needs and challenges which are directly related to their being uprooted. Our parish, founded and staffed by Jesuits, is the oldest in El Paso. We strive to build the Reign of God as we implement a pastoral program which seeks to evangelize in a complete and comprehensive way. Our ultimate goal is the formation and education of the whole human person: body, mind and spirit. Our model of life, service, humility, and love of God Is the Mother of God, Mary, La Virgen de Guadalupe. Sacred Heart Church was a gift to the Diocese of El Paso by Fr. Carlos Pinto, S.J., the Apostle of El Paso. 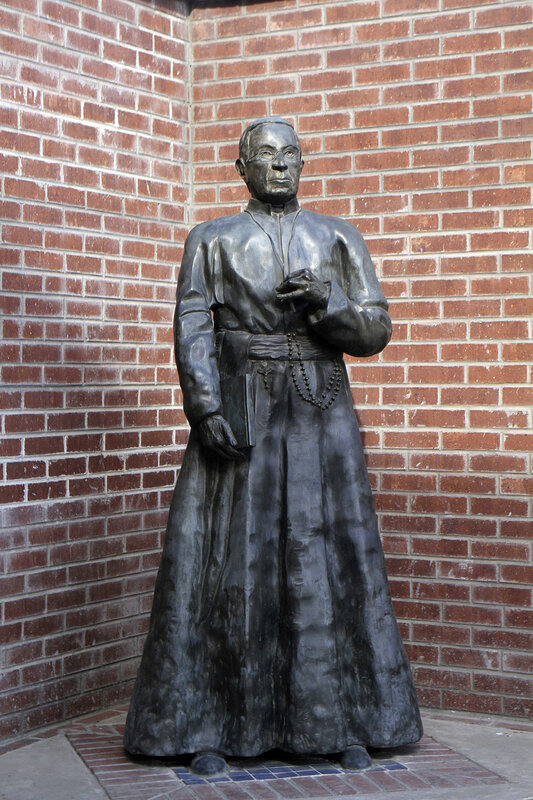 In 1892, Padre Pinto built two churches with schools–Sacred Heart for Spanish-speaking Catholics and Immaculate Conception for the English-speaking Catholics. The original church was dedicated on June 9, 1893. in November 1898, the rectory was completed. A second story was added to the rectory in 1911 which enlarged the residence to 22 rooms. Sacred Heart Parish has been continuously staffed by Jesuits since its founding 120 years ago. The original church was replaced in 1928-29 by the present larger church with a capacity for 2,000 worshippers to accommodate the influx of Mexican refugees during the era of religious persecution in Mexico. Sacred Heart remained under the administration of the Jesuits of the Mexican Province until 1944 when it was returned to the New Orleans Province. On July 31st 2014, the Central and Southern Province (newly formed after the merger of the Missouri and New Orleans Provinces) took over the administration of this “frontier mission.” Today, the “Heart of the Barrio”, Sacred Heart has a strong and abiding spirit. Along with the vibrant sacramental life, the Church provides an adult education program offering various courses and a social service center assisting with the needs of the poor in the area. Cura personalis (care for the individual person) is a hallmark of Ignatian Spirituality. Magis (Latin for “more”) is also a promise of Ignatian spirituality, suggesting the spirit of generous excellence in which ministry should be carried on. Both of these terms–Cura personalis and Magis–have remained manifest in a small but mighty parish in El Paso’s El Segundo barrio for the past 120 years. The individual Jesuit priests and brothers who have led and listened in this U.S./Mexico border parish since its founding have individually and collectively lived and shared these formative principles as they have practiced attentiveness to the people of God, and reverenced those who they have encountered. Since 1893, the Jesuits of Sacred Heart Parish have provided both spiritual and practical ministries with the people from throughout El Paso, El Segundo Barrio and from across the border in neighboring Ciudad Juárez, Mexico. With over 400 years of combined experience, the array of region-wide ministries provided by the six-member Jesuit community together with their collaborators has been amazing.